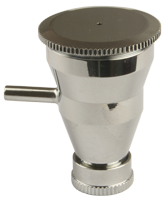 The CM-C has a 0.23mm needle and nozzle and a large 1/3oz (9ml) gravity cup with snap on lid to prevent spillage. The Custom Micron C is now also available with new features as the CM-C Plus. The original version of the CM-C and its parts will continue to be available from Airbrushes.com. 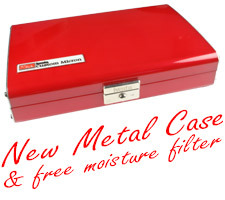 The Custom Micron Series come in a smart, red metal case with a FREE pistol grip moisture filter. The CM-C has the option to change to a 0.18mm head system for even finer detail. To retain the ultimate performance of your Custom Micron, Iwata recommend that you fit a complete matched head system or, if you require a replacement nozzle only, that you send your airbrush in for a technical expert to fit a replacement nozzle (See service/repair).